(a) Why are adolescent girls the worst sufferers? (b) What happens to a girl when she loses mobility? (c) Who, do you think, are more vulnerable to adolescent health problems– boys or girls? Why? (d) What major problems do boys face during adolescence? (e) Why should all of us say `no’ to drugs? 4. Every year millions of people all over the world die unnecessarily as a result of pollution. These unfortunate and (a) toxic deaths are brought about by four specific factors. Firstly, air pollution from factories, burning trash, and vehicle (b) odour cause pneumonia, bronchitis and other respiratory diseases. Then, water pollution from industrial discharge, the indiscriminate (c) dump of toxic chemicals, and the (d) disposal of human waste into rivers and canals causes poisoning and (e) waterborne diseases such as cholera and diarrhea. The next factor is the noise pollution from vehicle horns and (f) microphone that might cause aggression and damage hearing. And finally, (g) fume pollution from dumped or untreated human waste causes serious discomfort to our sense of smell, and attracts disease-bearing (h) creature such as rats and flies. We should take (i) determined action to control these problems and clean up the environment to (j) avoid these unnecessary diseases. We all know what a dream is. Generally we dream during our sleep. Some dreams are sweet or (a) unpleasant. When we dream something extremely bad, we call it a (b) horror dream. Dreams have no (c) shape. They are soft and (d) untouchable. The dream we have during the day time es called (e) lucid dream. Dreams have fascinated philosophers for thousand of years, but none could (f) say specifically what dream actually is. Dreams can be extraordinarily (g) clear or very vague. While many theories have been proposed no consensus has emerged. It is important to consider that science is still (h) searching the exact purpose and function of sleep itself. Some researchers suggest that dreams have no (i) practical purpose. while others believe that (j) it is essential to mental, emotional and physical well-being. (i) All the servants were called and interrogated. (ii) In order to find out the thief, the judge chalked out an intelligent plan. (iii) Once a gold necklace was lost from a rich man’s house. (iv) The servant’s were summoned to the court but they denied having stolen the necklace. (v) When the servants came to the court the next day, the thief had already cut off an inch of his stick. (vi) But nobody confessed their guilt. (vii) So the owner of the house lodged a complaint in the court. (viii) The judge found one of the sticks shorter than the others and in this way he could easily catch the thief. (ix) Naturally it was suspected that one of the servants had stolen the necklace. (x) He gace each of the suspects a stick of equal length and said that one of the sticks would increase by an inch the next day. Heartiest (a) congratulations on your grand (b) success. I became (c) extremely happy and (d) delighted on being (e) informed that you won the 1st prize in the 4th Asian Painting Exhibition. To be the first in an international (f) competition is not the pride of the (g) performer only but of the (h) entire nation. By being so, you have (i) earned laurels for the country. I wish your (j) continuous success in this field. Keep on trying. Have a nice day. Adolescents (a) ___ on their (b) ___, their communities, schools, health services and their workplaces to (c) ___ a wide range of skills that can (d) ___ them to cope with the (e) ___ they face and make a successful transition from (f) ___ to adulthood. Parents, members (g) ___ the community, service providers, and (h) ___ institutions have the (i) ___ to both promote adolescent development and adjustment and to intervene (j) ___ when problems arise. (i) Still challenge remained with the immortal one. (ii) Strangely enough, whenever Hercules knocked off a head of Hydra, two new ones erupted in its place. (iii) Hercules, a Greek mythical hero, was the son of Jupiter and Alcmena. (iv) These huge tasks in Greek myths are called ‘The Twelve Labors of Hercules’. (v) It had nine heads of which the middle one was to be immortal. (vi) One of the tasks was to slay a monster called Hydra that was ravaging the country of Argos. (vii) His cousin Eurestheus, the king of Mycenae, made him undergo some difficult tasks. (Viii) Eventually, with the help of lolaus, his devoted servant. Hercules succeeded in burning all the heads except the ninth. (ix) However, with much effort, he buried the immortal head under a huge rock and completed the task successfully. (x) Initially Hercules started striking off its heads with his club. (a) What are the main sources of water? (b) What fills the air around the Buriganaga? 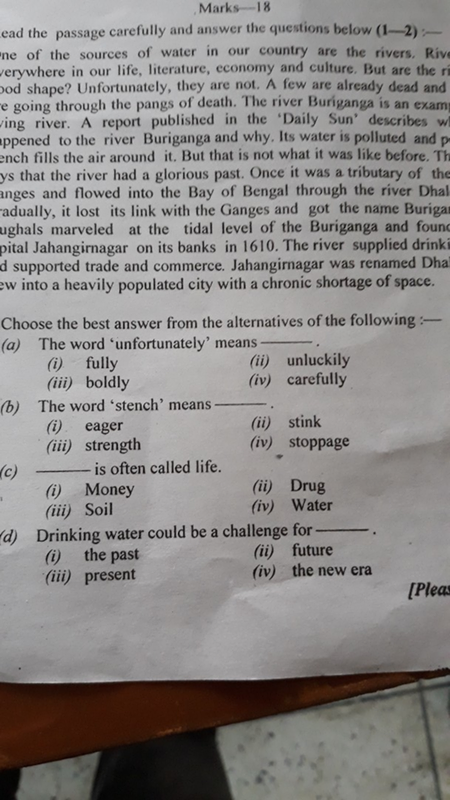 (c) What was the relation of Buriganaga with the Ganges? 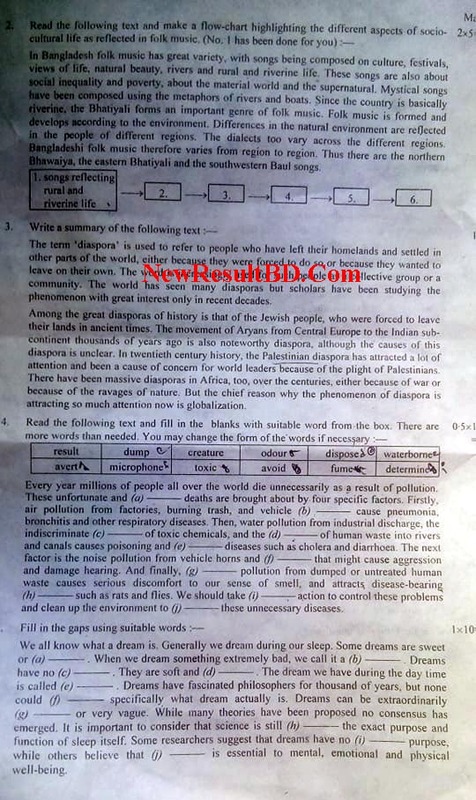 (d) What was the condition of the river Buriganga in the past? (e) How did Buriganga flow to the Bay of Bengal? 03. Fill in the gaps with suitable words. Bangledesh is our (a) country. It fought (b) nine months to (c) gain freedom. People here speak Bangle. India is our good (d) friend/neighbor. 04. Summarise the above passage in five sentences. (a) Kazi Nazrul Islam was born in 1899. Ans: When did Kazi Nazrul Islam born? (b) He was active and honest. Ans: How was he? (c) We planned to attend the class. Ans: What did we plan? 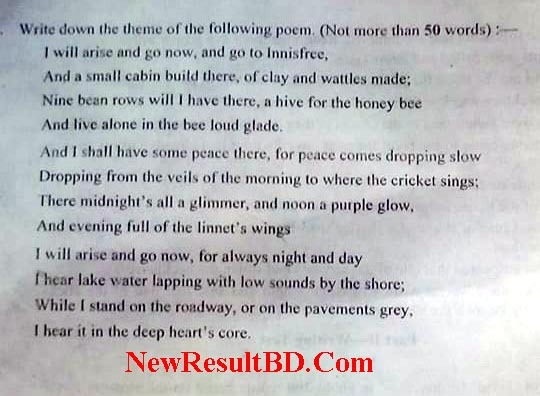 (d) I shall go to Dhaka tomorrow. Ans: When will I go to Dhaka? (e) Shakespeare wrote Hamlet. Ans: Who wrote Hamlet? (f) My mother introduced me to all. Ans: Who did introduce me to all? (g) This book costs me 10 taka. Ans: How much this book cost for me? 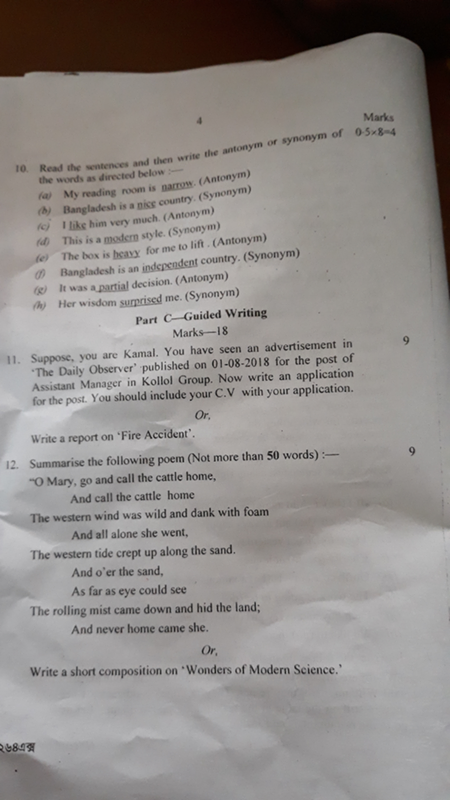 (h) My uncle is a teacher. Ans: What is my uncle? 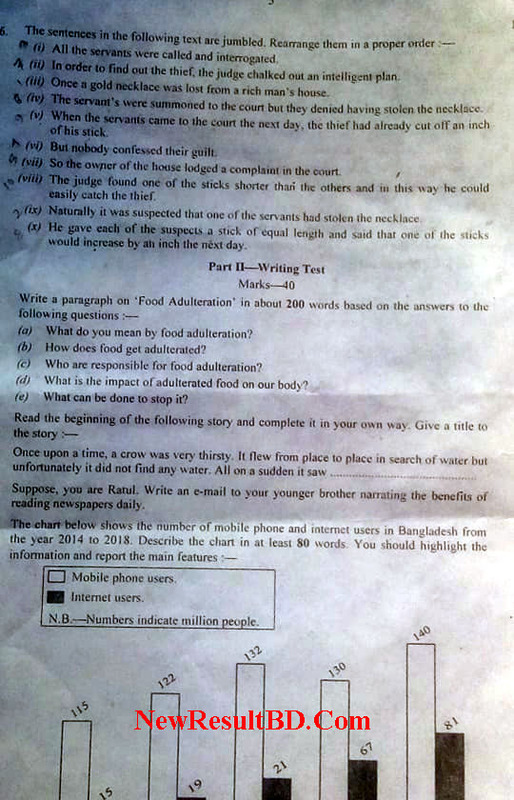 a) Mr. Jamal cannot buy a mobile phone, * let alone computer. b) His father is sick. He needs to go home * as soon as possible. C) He behaves * as if he were mad. D) I *would rather die than beg. E) * There lived a famous King in Scotland. F) Taj Uddin Ahmed was a great leader. He * was born in 1925. G) You *have to work hard to succeed in life. H) *It is a matter of great joy that we have won the match. Life c) by doing hard work. If I were a child again! Gulliver’s Travels is a famous book. The work is going to be done. Each boy and every girl has a pen. We like to go there. Mary was a little girl who was asked to bring the cattle home. She went out of the house alone calling out to them. Dusk was falling by then and the day was stormy and dark, tides were rising. As soon as she landed on the shores of Dee to reach the land. She couldn’t even see where the land lay and ultimately the sea pulled her in. 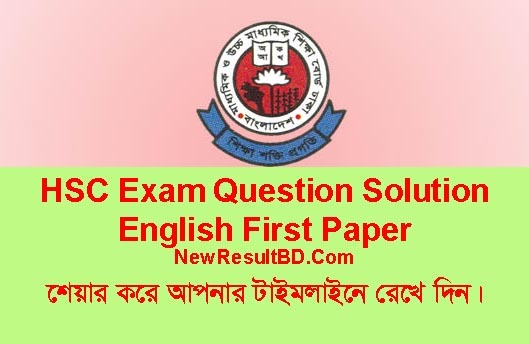 HSC English 1st Paper Question Solution Dhaka, Rajshahi, Comilla, Jessore, Chittagong, Barishal, Sylhet, Dinajpur and Madrasah Board will be here after getting questions and doing solutions.